VELUX have created a range of blinds that have been designed to fit perfectly to their range of high quality and high performing VELUX roof windows. 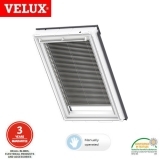 Here at Roofing Superstore we are proud to offer a wide range of blinds from VELUX, at our famously competitive prices. Venetian blinds are popular due to their flexibility, light control and easy installation. Venetian blinds typically consist of a number of horizontal slats that can not only be raised and lowered, but can also be pivoted, to control the amount of sunlight that enters the room. Traditionally, Venetian blinds are operated using pull cords, one cord to operate the raising and lowering of the blind, and one to operate the angle at which the slats are. 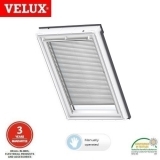 However, VELUX venetian blinds come with a cordless operation, removing the potential safety hazards of pull cords whilst also adding a touch of minimalism and class to your home. 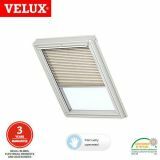 To operate the VELUX venetian blinds, simply pull the control bar, which is situated at the bottom of the blind, and raise or lower the blind as you wish. To adjust the amount of light entering the room, there is a simple grip on the right hand side of the blind, which can be raised or lowered to achieve the desired angle of light. As well as the ease of operation, there are a number of other benefits when looking at VELUX venetian blinds. 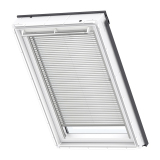 Firstly, the slats within VELUX venetian blinds are manufactured from lacquered aluminium. This means that they can be used in any rooms that have a high humidity, as they will not be affected by moisture. Additionally, they are incredibly easy to clean, stain resistant, and just require a simple wipe down, making them perfect for rooms such as kitchens and bathrooms. 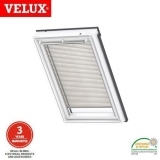 Another benefit of the VELUX venetian blinds is that they provide you with a way of controlling the amount of light that enters the room, whilst still providing you with the option of total blackout or maximum light if required. The slats in the blind do not have any holes in, and are enclosed in sleek aluminium side channels, to prevent light from entering the room via the edges. 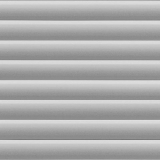 VELUX venetian blinds come in a range of colours, and each size has been manufactured to fit an exact VELUX window size. If you’re unsure which VELUX window you have, simply open the window – it should be on the corner of the top sash, on the data plate. For any other questions or queries regarding VELUX venetian blinds, or your latest project, feel free to call our team on 01752 692760 or use the live chat and they will be more than happy to help.